Have you ever noticed how some people just can’t carry a tune to save their life? Then there are those who, with proper voice training, can learn to sing - although they may never number among the ‘great’ singers. And there are the lucky few who were blessed with angelic voices - all they need to do is open their mouth. It’s the same with dog training. There are few gifted dog trainers. A common thread is that they understand the mind of the dog. Then there are those who ‘can’t’ train a dog - they may not have the patience, time, interest - or just the plain old fashioned gumption to do so. Fortunately, for the majority of us, we fall into the middle category: we can learn to train a spaniel. The ‘tools of the trade’ are basic: a whistle on a lanyard, slip lead, and a selection of puppy-sized dummies. Personally, I like the British buffalo horn whistle, British style slip and matching lanyard offered by Lion Country Supply as well as their durable firehose dummies. 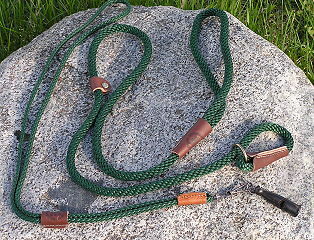 The puppy slip lead is made of a sturdy, but lighter-weight cord. I was pleasantly surprised to see that my six-month old pups were more responsive while walking on this lead. With this slip lead the task of teaching pup to ‘heel’ just got easier! The matching British single lanyard is very nice. It's lightweight, well-made with quality materials, includes a whistle swivel and it's attractive. However, it cannot be attached directly to the buffalo horn whistle. This was remedied quite simply with the addition of a small ring. I like the quality of construction of both the puppy slip lead and the lanyard, but found the lanyard to be a bit long for me - hanging below the belt. A shorter version would be fantastic. 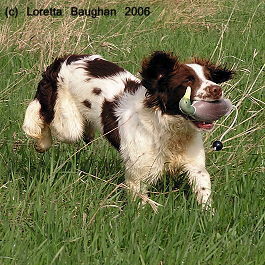 The British buffalo horn whistle is ideal for spaniel training, trialing and hunting. Each whistle has it’s own unique tone and it is pea-less, so won’t freeze up in inclement weather. Lion Country Supply's firehose dummies are extremely well-made. The cotton firehose material holds up very well and pups absolutely love them. 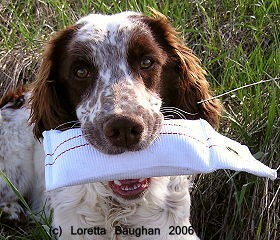 Firehose dummies are a great choice for pup's first dummy as they are soft and comfortable to carry. Just a quick toss in the hallway, rewarded with hugs and praise will start your pup on a pleasant retrieving experience. Purchase several of these bumpers and hide them around the yard or along a path - then take pup out for a fun walk. A newcomer to the dog training dummy market is Armadillo Foam, Inc. Offering knobby style foam dummies in addition to game bird-shaped dummies in both dog and pup sizes, their products add variety and spice to retrieving drills. These dummies are soft and flexible. They are made from non-toxic polyurethane foam with rope throws molded in. They can accept scent and they float. As with any training dummy, pup should not be allowed to chew them and they should be put away where pup cannot play with them when you are not training. These dummies are completely different from anything I’ve ever seen. The knobby dummy is available in a variety of patterns: solid white, hunter orange, candy cane stripe plus a high-visibility black and white. The quail and mallard dummies are footless, so there is nothing protruding that could hurt pup’s tender mouth. They come with a small bead handle which makes tossing them a good distance very easy. I particularly like the mallard. It’s molded with the head turned to one side, causing it to be off balance. When it is tossed, it rotates in a somewhat off-kilter fashion - which really grabs the dog’s attention. The pups quickly taught themselves how to carry the quail and duck dummies properly. 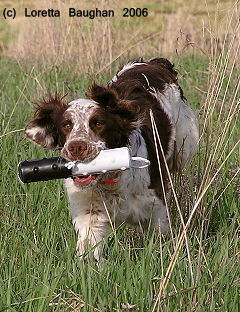 Lay the foundation for a positive retrieving experience right from the start. Dogs have a limited capacity to understand our language. They don’t understand full sentences. Keep commands simple. Certain words that are used as training commands, should be reserved only for that purpose. If pup has misbehaved and is called in - "come here" - then disciplined, pup will quickly learn to associate the words with a negative outcome. You may use "come" as a house command and "here" as a field command to establish separate meanings in the pup’s mind. I've heard trainers say, "Hey! what do you think you're doing?" when their dog has done something wrong in the field. The dog reacts to this, but it is more of a reaction to their owner's angry or gruff tone of voice and demeanor than that they understood what was said to them. The training process for a pup begins with basic obedience. You can enroll in a puppy obedience class in your community - or work on it on your own. The benefit of the class setting is that you will have the advice of an experienced instructor and your pup will have the opportunity for socialization with other puppies and their owners. For the spaniel with a future in the field, "hup" - which is the traditional spaniel command for "sit", along with "stay" and walking on a lead are practiced as yard work. 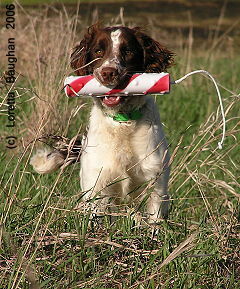 Linking up with a training group, spaniel club or professional trainer can be helpful. 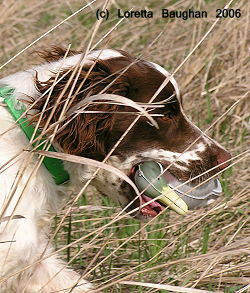 Resist the temptation to over-do the retrieving with a young pup. Remember, they are like small children in that their attention span is short and that they need to learn a little bit at a time. Too much retrieving and you run the risk that pup may become bored and loose interest. 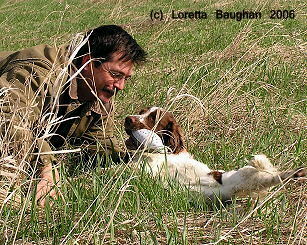 If you plan to hunt or trial your spaniel, it may be best that retrieving be an activity reserved for yourself. Once the pup begins to understand that bringing the dummy back to you doesn’t mean an end to the fun, the frequency of your retrieving sessions can be increased. Always stop while the pup is still excited and wanting more as this will keep his interest piqued. Avoid creating a delivery problem by not grabbing at the pup or by jerking the object from his mouth. Instead, let the pup bring it to you. "Once the pup begins to understand that bringing the dummy back to you doesn’t mean an end to the fun, the frequency of your retrieving sessions can be increased." From pup’s point of view, people are enormous. When encouraging a pup to bring a retrieve in, get down low to the ground... sit... or even lay on the ground. Talk softly, offering praise and encouragement as you allow pup to continue holding the dummy. A reluctant pup won’t feel intimidated and will be more likely to feel confident in bringing the object to you. This approach works well for most pups. However, there are always exceptions to the rule! If your pup is especially bold, hard-charging... or perhaps somewhat hard-headed, the submissive approach may not be effective. This type of a pup will likely read any sign of submissiveness on the part of it’s owner as weakness - and an opportunity for pup to claim the position of ‘top dog’ in the relationship. For one such as this, a stern - but never mean - approach may be more effective. With this type of a youngster, men have a natural advantage with their size, square shoulders and a deep voice that commands attention. Although it requires extra effort, a soft-spoken woman can claim ‘leader of the pack’ status with the stern approach: lowering the tone of her voice, standing erect with shoulders held square and making direct eye contact with ‘Mr. Independent’. It’s an ‘all business’ attitude and must be maintained even when not conducting field training exercises. Many pups will go through a phase of possessiveness with the retrieve. Your reaction may determine whether this is just a passing fancy or if it will become a full-blown problem. If you chase the pup, he will view it as a game of keep away. Scolding or harsh discipline may cause the pup to associate punishment with retrieving, and he may shut down. These are examples of what not to do. Instead, take it in stride. If pup tries to run off with the dummy, simply turn and walk away. Not wanting to be left behind, most pups will come running. When he does come to you with the dummy, be sure to create a fuss over the pup, lavishing him with excited praise. Don’t expect perfection from the start. It takes time. Take Cher, for instance. When she sang with Sonny, she was rather mediocre. Loose the husband and gain a good singing coach and - presto - she could sing! 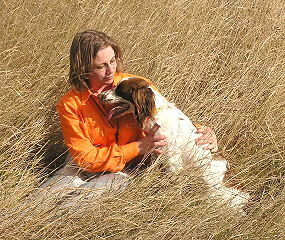 And with a well-bred pup, motivation, patience, commitment and the right tools, it isn’t difficult to train a spaniel.